University of Oklahoma redshirt senior quarterback Baker Mayfield (Austin, TX) has been selected as the 2017 Walter Camp Player of the Year. The Walter Camp Player of the Year is voted on by the nation’s 130 Football Bowl Subdivision head coaches and sports information directors. Other finalists for the 2017 Walter Camp Player of the Year award included quarterback Lamar Jackson (Louisville) and running backs Saquon Barkley (Penn State), Bryce Love (Stanford) and Rashaad Penny (San Diego State). 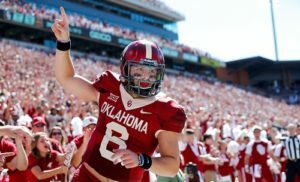 The 51st recipient of the Walter Camp Player of the Year award, Mayfield is the fourth Sooner player to win the prestigious honor, joining quarterback Josh Heupel (2000) and running backs Billy Sims (1978) and Steve Owens (1969). Overall, Mayfield is the 19th quarterback to earn the award. Mayfield is also eighth player from a current Big 12 Conference school to win the award, and the first since 2009 (Colt McCoy, Texas). Mayfield has been a standout for the Big 12-champion and second-ranked Sooners (12-1), who will face #3 Georgia in the semifinals of the College Football Playoffs on January 1 at the Rose Bowl in Pasadena, CA. The 2017 Big 12 Offensive Player of the Year, Mayfield leads the nation in passing efficiency (203.8), while ranking second in passing yards (4,340) and passing touchdowns (41). Mayfield has completed 71 percent of his passes (262-of-369) and has thrown just five interceptions in 13 games. He has thrown for 300 or more yards nine times, including a career-best 598 (24-of-36, 5 touchdowns) in a win against Oklahoma State on Nov. 4 that earned him Walter Camp National Offensive Player of the Week honors. On Dec. 2, Mayfield led the Sooners to the 2017 Big 12 title, passing for 243 yards and four touchdowns in a 41-17 victory over TCU. Mayfield has thrown at least two touchdown passes in 26 consecutive games. A two-year captain, Mayfield, who played the 2013 season at Texas Tech, is the only player in Football Bowl Subdivision history to pass for at least 13,500 yards (14,320) and rush for at least 1,000 yards (1,082). He ranks second in school history in passing yards (12,005) and touchdowns passes (117). Mayfield, along with members of the 2017 Walter Camp All-America team, and other major award winners (Alumni Award-Eddie George; Man of the Year-Calvin Johnson; Distinguished American-Lee Corso), will be honored at the organization’s national awards banquet, presented by David McDermott Lexus of New Haven, on Saturday, January 13, 2018 at Yale University’s Lanman Center in New Haven.